MEGYN KELLY: Going to get back, now, to our top story this afternoon. We are awaiting specifics on the alleged suspects involved in this suspected terror plot. One is reportedly a U.S. Citizen. According to our research team here at fox news, there have been at least 46 home-grown, violent jihadist threats of attacks inside the U.S. 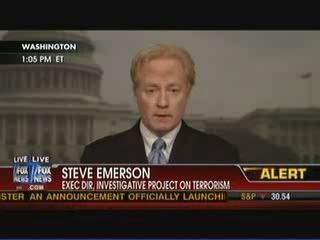 Since 9/11 Steve Emerson is the executive director of the investigative project on terrorism and author of "jihad incorporated." Steve, thank you so much for being here. Tell us what you know at this hour is the latest in terms of this threat? STEVE EMERSON: Actually, there are two American naturalized citizens here legally but who are believed to be involved in this plot. The third person seems to have come from Waziristan but they don't know where he is. Number two and most importantly is that the information comes from a single source, and there was a debate within the intelligence community about the credibility of releasing this information, but since the source was considered credible and the treasure-trove of documents seized out of bin Laden's safe house constantly mention 9/11 anniversary as a time the launch an attack, they decided to put two and two together and issue this type of alert. The specificity [of details] went down to the point of saying truck bombs, talked about New York City, [and may have] talked about possible other cities. But again, it was a single source piece of intelligence, and there's always a danger when you have single source intelligence without confirmation which is why the White House said "credible but unconfirmed," sort of a contradiction [of terms]. But that's the way they phrased it. KELLY: I know they've been looking at this as a possibility since bin Laden was killed, they found his papers that there were general advisories going out to the terror and intelligence communities. I should say the intelligence community about terror threats prior to this. But something happened within the last 48 hours to gin up the concern. Was that the information from this source which had proven credible in the past at least sometimes? EMERSON: Yes, that's exactly true. I don't know the history of the source, but I can tell you that since the bin Laden raid and since the exploitation of the computers, the documents, and the phone numbers, you know, they really found a treasure-trove of potential attacks around the world, but definitely an emphasis on attacking the United States on the anniversary of 9/11. Then five days after the killing of bin Laden, an al-Qaeda team announced that they were going to avenge his death on the 9/11 anniversary. So that was constantly emphasized and I can tell you since that incident, I have been getting briefed about 9/11 anniversary as the date to be looking for a potential attack. But, again, that wasn't confirmation of something credible. EMERSON: The credible information that you just pointed to today came 48 hours ago. KELLY: before I let you go, we're not just talking about New York and Washington, correct? There are other cities they are concerned about at least today. EMERSON: Yeah, the FBI briefed police chiefs in, I think, five cities: Chicago, L.A., New York and two others. New York was specifically mentioned. I cannot tell you if the other cities were mentioned. But definitely the information, concerned the notion that if New York wasn't chosen, another metropolitan center would be chosen. KELLY: We should mention to our viewers they have not elected to raise the security alert, homeland security level of concern, so nonetheless, you can see, i mean, that video we were showing with the card checks in New York at least, I can attest to it firsthand- it's real, it's happening, and it's going to keep happening at least through Sunday. Steve Emerson, thank you so very much for the latest information. We appreciate it.